I laika it but I didn’t love it. From the makers of Coraline and Paranorman comes a delightfully animated, if predictable affair that certainly impresses in detail but lacks in story. Enough for the little ‘uns but I can’t help but feel that some of the darker and more satirical moments may whizz over their head and leave them fidgeting in their seats. As I’ve said before; kids films, or should I say, family films are always a challenge. They have a lot to aspire to and must have enough pace, character and story to entertain children and adults. But normally, a good portion of the time you can bank on them to deliver the goods. Disney, Pixar and Dreamworks have proven this time and time again. They are normally the films I can rely on in the ever growing list of mediocre and plain right terrible movies I’ve had to endure this year. Now the American stop-motion studio Laika certainly delivered with the creepy but brilliant Coraline. ParaNorman was a mixed bag. A watchable one. At its best, dark, very funny and endearing. But let’s not forget the ending wasn’t perfect. It felt like it had run out of ideas and rushed towards a corny and flat finale. So what’s this one all about? The Boxtrolls are a community of quirky, mischievous creatures who lovingly raise an orphaned human boy named Eggs (Isaac Hempstead Wright – Game of Thrones) in their cavernous home built beneath the streets of Cheesebridge. However, when evil exterminator, Archibald Snatcher (Ben Kingsley) comes up with a plot to get rid of the Boxtrolls. Eggs decides to venture above ground and “into the light”. Eggs? That’s right. Eggs because that was on the box that our protagonist chose to wear. A nice touch. The opening was a little slow and a little dark with a Boxtroll appearing to steal a child and Snatcher brokering a deal with the high class elite who appear to be wasting the town’s budget on fancy hats and rich cheese. A fun poke at the inevitable class and society issues that still plague the present day. The little ones may find themselves fidgeting a little bit. Even I could feel my eyes looking at my watch. That is until our little cardboard creatures finally make their appearance. The animation is fantastic. Once the little sewer gremlins emerge from their cavernous domain and begin scavenging the streets, I was in awe. Their little expressions and the detail in which they use their boxes as props to climb over gates and as cover from any passing humans. Their bickering and amusement with the rubbish dumped on the streets made them instantly loveable and entertaining. The 3D was a complete waste of time. Thoroughly disappointing as this film would have been the perfect platform. Also pretty poor with the inflating ticket prices and decreasing cinema numbers. Do not invest. The cast were perfectly chosen for the roles. And what a cast! Hempstead Wright has already made an impression with Game of Thrones but certainly delivers a solid voicing performance. But he was always going to fall second fiddle to the legend that is Sir Ben Kingsley. His prowess and talent just adds so much to the delightfully disgusting Archibald Snatcher. His name must surely be a nod to the infamous child villain, the Child Catcher from Chitty Chitty Bang Bang. Only a more demented version, with top hat in tow, of course. Richard Ayoade (Moss from The IT Crowd), Nick Frost (Shaun of the Dead) and Tracy Morgan (That’s right! 30 Rock) were brilliant as Snatcher’s numbskull henchmen who constantly try and justify with one another that they are really the good guys. Not enough of them in my opinion. Elle Fanning (Maleficent) was fantastic as the stroppy but feisty Winnie who befriends Eggs. Jared Harris (Mad Men) and Maurice LaMarche (Futurama) were also voices that stood out in the gang of mindless elitist cheese fanatics. The Boxtrolls is watchable and at times quite fun. The chase sequences and the encounters with the Boxtrolls were a sight to see. But for me, the story just didn’t seem to flow that well. It seemed a bit mechanical and all a bit predictable. Desperate twists and turns were pulled out of nowhere as the film meandered along. Twists that were hardly revelatory or necessary for that matter. The whole spiel early on that the Boxtrolls were cannibalistic murderers was always going to be a bluff. Eggs and Fish (the Boxtroll who “adopted” him)’s relationship was nicely done and you could feel for the pair, even if half of the time you couldn’t understand what they were saying to one another. A running joke that happens every time Winnie demands a translation. Eggs’ adjustment into the human world after ten years of “captivity” was an endearing and funny opportunity. His introduction to a high class social party brought the odd chuckle. But the tone seemed to be too uneven. Coraline was endearing but deliciously dark. 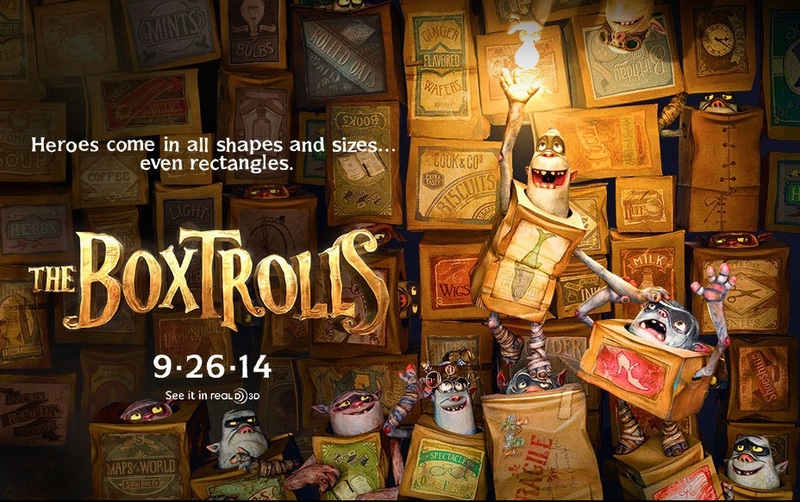 Boxtrolls starts off dark. Goes full slapstick and cheesy. Then a little darker with a rushed and incredibly corny finale. It felt like it wasn’t sure how far to push or how dark to be. An achilles heel for Snatcher was an unexpected twist that led to a deliciously macabre finale. There’s enough for everyone. Silly boxtrolls for the kids (and adults) and macabre Dickensian visuals with a drop of class satire. Not bad by any means but will it stand against the likes of The Nightmare Before Christmas, Caroline or even ParaNorman? Sadly, not for me.